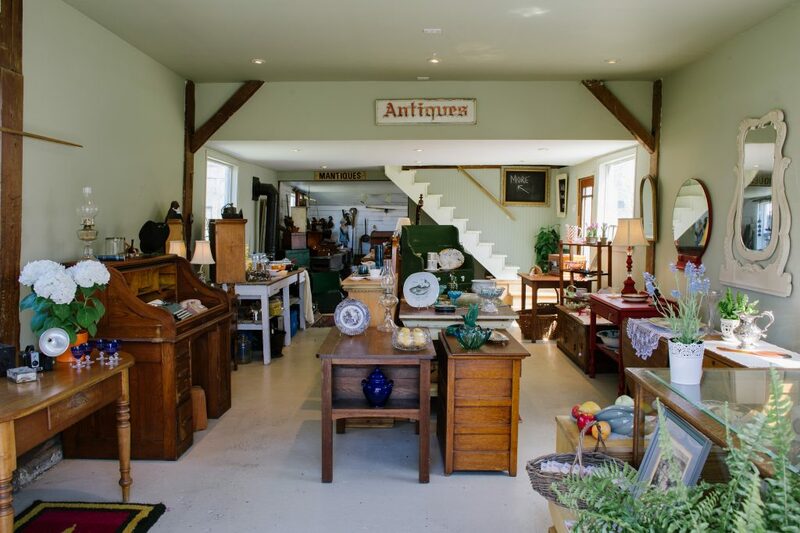 Prince Edward County is renowned for its many antique stores and vintage shops, and there are more than a dozen different sellers stocking a large variety of furniture, collectibles, glass, china, pottery, tools, ephemera, home décor items, garden furniture and ornaments and more. An antique by another name is vintage, and all things vintage are in favour at present. Reduce, reuse, recycle is a necessary mantra of our times, and repurposing quality pre-owned goods ticks all the boxes with one-of-a-kind flair. Mid-century modern (MCM) is very popular, reviving décor from the 50s and 60s. Painting furniture is a trendy way to reuse quality outdated pieces. Think “What else could this be?” and you’ll be on your way to creating your own eclectic style. County antique shops are as diverse as the people who own them. When you walk through the door, nine times out of 10, you will be greeted by the owner. The antique and vintage market qualifies as very small business and few owners can afford to hire staff. Many of the shops in The County are on the owner’s home property so be aware that opening hours can be less than exact due to life getting in the way! Shopping at an antique store is not like shopping at Walmart. There are no suppliers, or offshore factories, or the ability to “order 20 more by next week.” Each and every article in the shop has been painstakingly found, purchased, transported, cleaned and placed for you to find as you search through many hundreds of inventory items. 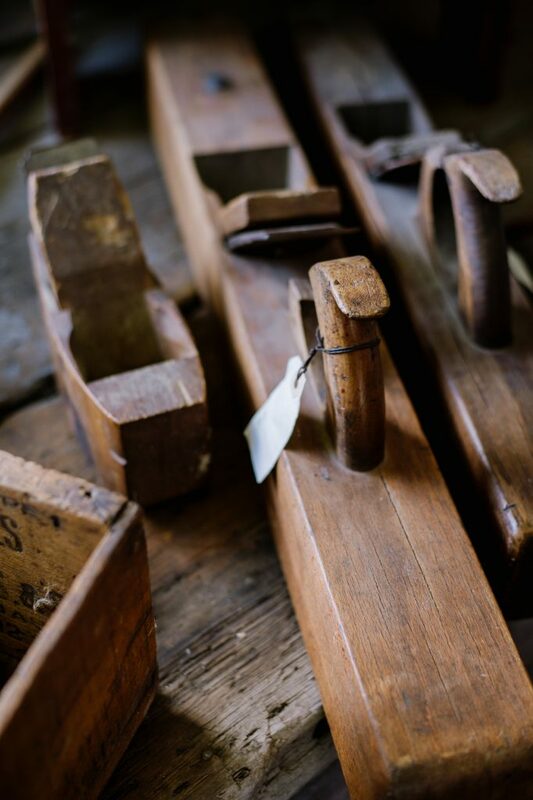 Antique dealers are hunters by nature, and there is an auction, yard sale, house call, newspaper ad, or phone call preceding the acquisition of every single piece in the shop. Time is spent curating each wonderful, beautiful, individual element and presenting it to you. 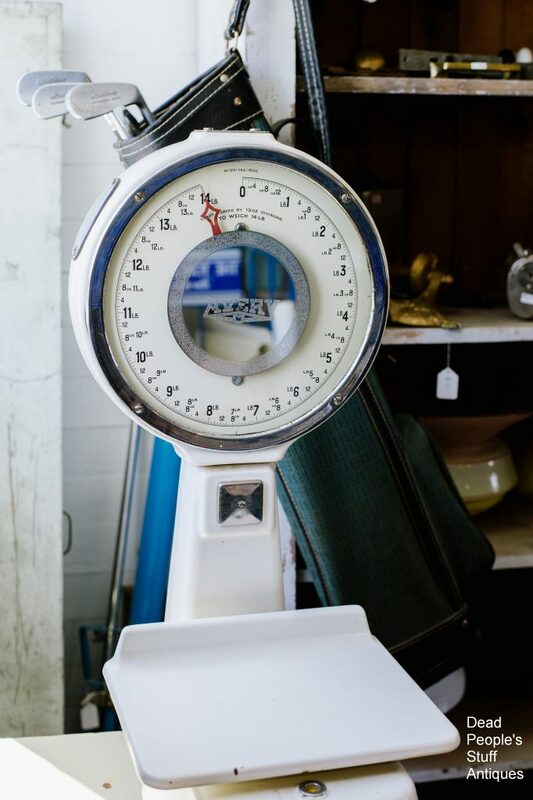 While haggling is a time-honoured practice at flea markets and bazaars, there may not be as much wiggle-room for a bricks-and-mortar antique shop with overhead costs like heat and hydro. If an item is priced at $10 and you ask for a discount, chances are you will be refused. The dealer probably paid $5 after driving somewhere to acquire it and then cleaned it and placed it in the store that requires heat and light. On bigger ticket items (more than $100) asking for a 10% reduction in price may not be out of line, but be advised that there are times when the dealer’s margin is very thin indeed. Asking for a discount is best done politely and respectfully. The fastest way to ire a shopkeeper is to say, “I’ll give you….” Let’s face it; you wouldn’t say that at Whole Foods. “Would you take [a figure that’s more than 75% of asking price]” is a good beginning. Cash is always preferred, but most shops can take a credit card, and some can take debit thanks to internet banking. Hours of operation can be quite fluid from November to May. The ambient temperature inside the bricks and mortar, and the proclivities of the owners, dictate whether a shop will remain open over the winter. It is always best to call ahead to make sure the shop is open. Some shops are happy to open by appointment. Plan your trip, check store websites for days and hours of operation and call ahead if necessary, then head out to see what treasures you can find. Most of all have fun and enjoy your antique hunting adventure! 2. Collier Collection 2594 County Rd 13 South Bay, 613-438-9057 | Barnboard and hardware, duck carvings, paintings, photos, frames, Japanese handpainted items, majolica, pyrex, retro glass and glass caddies and much more. 3. County Traders 39 Stanley Street Bloomfield, 613-393-9993 | A consignment warehouse of furniture, art, books, kitchenware and other finds. 4. Dead People’s Stuff 388 Main Street Bloomfield, 613-393-3193 | Furniture, “mantiques” and tools, windows and doors, stained glass, vintage decor, kitchen ware and more. 5. FRUgal and Company 167 Main Street Picton, 613-476-5151 | A wide selection of retro pieces, including furniture, dishes, magazines, records, kitsch and more. 6. Hickory Tree 14938 Loyalist Pkwy Bloomfield, 613-393-5040 | Specializing in furniture restoration and custom furniture built from recovered century old and new wood. 7. 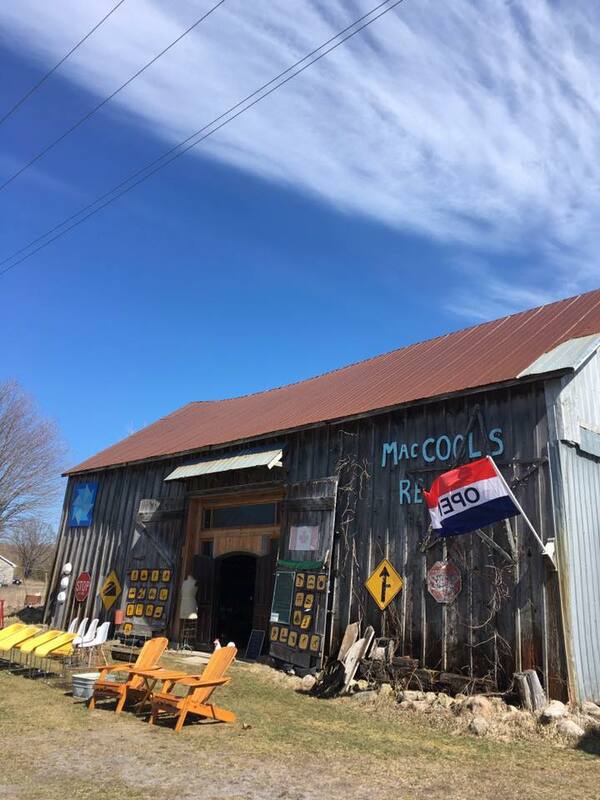 MacCool’s Reuse 1149 County Rd 12 West Lake, 613-393-5797 | Mid-century modern and cool 50s finds abound in this old barn, where vintage pieces are mixed with handmade pieces. 8. Memory Factory 21712 Loyalist Pkwy, 613-438-2331 | Stocking contemporary and vintage books, depression and carnival glass, primitives, vintage and costume jewelry, Nippon china, kitchenware, bakers’ tables, postcards, Gate-leg tables, vintage furniture, Royal Doulton figurines, vintage buttons and military items. 9. Porkie’s Place 1540 Hwy 62, 613-393-5027 | Tools, dishes, antiques, toys, oil cans, blacksmith anvils, tongs, hammers, forges, vises, planes, cast floor grates and tractor seats, furniture, old hardware, books and pictures. 10. Retrospective 280 Main Street Bloomfield, 613-393-3339 | Dishes, furniture, decor and more. 11. 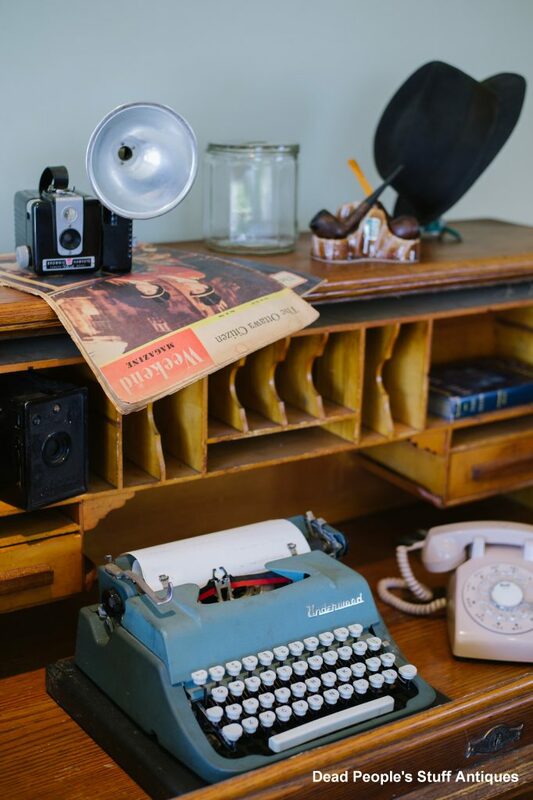 Stowaway Vintage 1606 Cty Rd 10 Cherry Valley, 613-920-1085 | Selling quality vintage clothes and furniture, old school toys, art, vinyl records, lighting, collectibles and more, it’s worth a stop for the amazing vintage toy train running through the rafters. 12. The Local Store 768 County Rd 12 Bloomfield, 613-393-1797 | Canadian folk art, baskets, crocks, English serving pieces, crystal, pottery, silver plate everything, American pressed glass goblets, European china, silks and more. bi-weekly car boot (trunk) sales too! 13. The Sword 20581 Loyalist Pkwy Consecon, 613-392-2143 | Specializing in antique muskets, rifles, shotguns and pistols, reproduction and replica weapons, costume jewelry, Blue Mountain pottery (including Collingwood, Ontario potters), ceramics, crystal and art glass. 14. The Vintage Barn 980 Cty Rd 8 Picton, 613-476-4286 | Upcycled furniture and home decor for treasure hunters. 15. Tick in Tyme 35 Wellington Street (Loyalist Parkway) Bloomfield, 613-393-5886 | Featuring interesting clocks, watches, china, pottery, kitchen collectibles, linens, oddities and small furniture. 16. Young’s Antiques 1214 Cty Rd 3 Rednersville, 613- 969-1905 | Re-purposing specialists, Young’s also offers a wide range of vintage wooden wares, pottery/yellowware, along with sporting, nautical, hunting and fishing items, old church and century home windows, vintage whimsical folk art pieces.